Want to increase your food-service profits? Profits with popcorn can exceed 80 percent. Star® popcorn machines bring profit, aroma, taste and fun to your food-service application. Popcorn is a healthy on-the-go snack for today's busy lifestyle. Star®'s high-quality commercial popcorn machines produce maximum popcorn volume and minimal waste. The Lil' Orbits Model 1200 mini-donut machine is an ideal addition to any concession operation. Mini-donuts are inexpensive to produce and offer customers an excellent value. Mini-donuts can be made automatically in front of the public. Aroma, action and taste make them an instant, profitable hit. Lil' Orbits mini-donut machines are portable for quick and easy setup, and carry a lifetime equipment guarantee. A full line of supplies is available worldwide. Lil' Orbits and Orbie brands are recognized in over 90 countries. Tomlinson Industries has a complete line of quality kettles for large or small operations, salad bars and other self-serve areas. 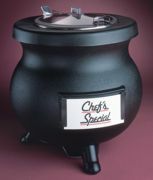 In 6-, 8-, 10.5- or 12-quart sizes, Tomlinson kettles are the answer to all your soup service needs. Tomlinson offers the Deluxe Frontier Kettle®, Frontier II Kettle®, Glenray® Kettle and a Dual Food Warmer for merchandising two varieties of soup or other food products at one time. The Southern Pride XLR Series ovens use fireplace-sized logs to create that distinctive flavor, aroma, color and texture in all of the company's wood-burning BBQ pits and smokers. The amazing thing with any Southern Pride model is simple, automatic operation. There's no guesswork, no need for constant attention, no need to turn the meat while it's cooking—the oven does all the work. 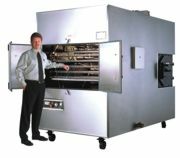 The XLR Series are large-capacity cookers for high-volume restaurants, institutional and industrial-type applications, such as caterers, commissaries and USDA processing plants. Designed and constructed to meet the demands of continuous, heavy-duty industrial use. Gold Medal Products, the ultimate one-stop concession source, presents the Sno-King, Sno-Kone Machine. Enjoy the phenomenal profit potential of Sno-Kones with this easy-to-use, durable machine, built by one of the industry's leading concession equipment manufacturers. 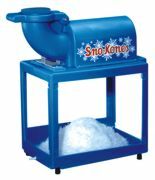 The Sno-King is simple to operate and produces batch after batch of icy "snow" for the best Sno-Kones. It is easy to keep up with big crowds and high demand with this machine that features a 1/3-horsepower 1725-RPM motor. Tough and built to last, this machine will produce consistently perfect product for years to come. The machine is an attractive merchandising countertop setup. Famous for its healthy approach to specialty beverages, Dr. Smoothie formulates products with the consumer's good health in mind. Dr. Smoothie 100% Crushed Fruit Smoothie Concentrates contain quality vine-ripened fruits, containing no corn syrup. Each 16-ounce smoothie contains three-plus servings of fruit. Shelf-stable. Just add ice and water. Café Essentials include mochas, lattes, chai(s), vanillas, bases, decafs and flavored blends. Soy-based and reduced-calorie blends available. Bio Bars are healthy whole-food nutrition bars, perfect for athletes. Nature's Nutrients are whole-food nutritional supplements. Amino Hydrate is a sports hydration drink containing hydrolyzed collagen and vital amino acids. The ClassicCooker® Club Grill from Blue Ridge Mountain Cookery features a large 18-inch-by-66-inch stainless-steel roller-grate surface, eight individually controlled stainless-steel tube burners, stainless-steel grill body, 160,000 BTUs (up to 800°F), powder-coated tube steel cart, lava rock and 2-inch-deep stainless-steel drip pans standard. Options include griddle plates and stainless steel half- or full-dome. Easy to clean—all stainless steel. Easy to move—in-mounted front wheels. Easy to store—nothing sticking out past grill frame. Easy to operate. Also available in 3-foot size and Tabletop Style. Limited lifetime warranty. FabWright Inc. is a full-service custom stainless-steel fabricator for the food-service industry. 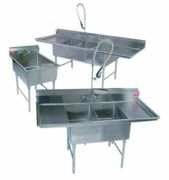 FabWright's products include commercial food waste disposers, food prep sinks, hand sinks, drop-in sinks, multi-wash stations, work tables, dishwashing tables, countertops, cabinetry, shelves, pot racks, retractable hose reels, trim-waste disposal systems and much more. FabWright's products are all hand-crafted with the highest quality standards and excellent customer service. FabWright's certifications include National Sanitation Foundation (NSF), ETL, UL, NSF7 (Refrigeration), CE and CSA. All products are built to order.